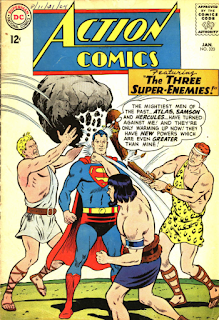 TuesdayArtGroup: Hercules, Samson and Ulysses! They played hell with those ruins. That first prop he picked up as a shield against spears looked really heavy. Like the prop maker chuckled and thought "pick this one up Hercules." But not the one you were thinking of Tom? Or is that Hercules plan. Dress everyone up in enemie uniform colors. PS. I reviewed Scott MacMahon's book and bought it. Second bit of good news, I can now read kindle books with the new computer. No, not the movie I was looking for. Just something I stumbled across in my search. I thought if I looked at clips from all the old Hercules movies I might get lucky. I love the weird sci-fi whistling sound the spears make flying through the air. If we had been grownups back then, our job would have been painting cardboard boxes to look like ancient two-ton temple stones. The fight among the ruins was like game background design. Reusing all those blacks to make different looks for walls to knock over. 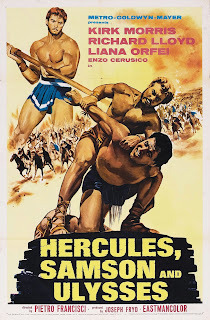 The masonry that Hercules picks up as a shield should have been a signal to Sampson that it might not be an easy fight. Funny how he felt he had to pick the block up all the way off the ground to shield himself from the spear instead of just standing it up and ducking behind it. Show off. This is hilarious. Esp'ly Tom's musing that back in those days we'd be the ones painting papier-mâché props. Not me. I'd be the one doing in-betweens for the cartoon short they must've run before screening this flick. Funny to think of the storytellers of the era coming up with this... striving to find some vehicle to bring mythic action to the big screen. We laugh, but based on box office today, they were prescient! 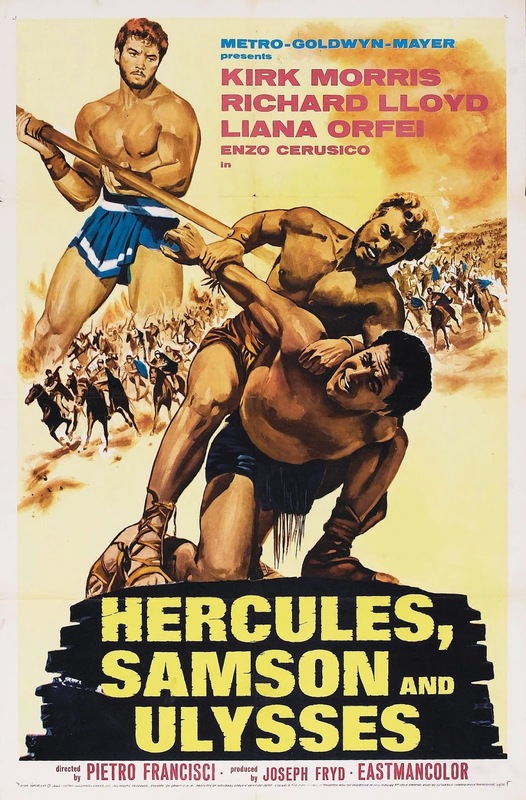 Looking for a bridge between old lit and pop culture and hoping it will hit...The lineup for this movie (Samson? Hercules?) shows just how rocky it could get trying to mine that vein. I read that great book Mythology by Edith Hamilton. I realized as I read it that it was where Stan Lee got all of his ideas. Huge doses of the absurd for deeds but pathological levels of human frailty to balance the deeds. Plus, the youtube video has the fighters get into poses taken straight from the famous greek pottery. They probably made a million of those urns and pots with the wrestling motif. Just a couple survive. Some archaeological dig will someday reveal a horizon-line-size underground warehouse of them. With bonus limerick scrolls inside. I like the part where Hercules picks up Samson and does this totally useless airplane spin before throwing him back down on the ground. Very funny comments from you guys.